A deceptively quiet novel full of twists and turns you’d expect from a thriller, right up to the last few pages! Gabrielle’s first novel was a literary sensation, but years on, she hasn’t been able to write a second book. Fan and novice writer, Simon, asks to meet her. She finds him alluring and lets him lodge with her, but as time goes on, he seems more interested in Gabrielle’s golden friend, Madeleine, who died in tragic circumstances many years before. Both Gabrielle and Simon are holding dark secrets they need to face up to, but can they change the way they see themselves and each other, forever? 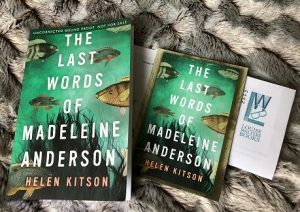 This novel is beautifully written by award-winning poet, Helen Kitson. It’s accessible literary fiction which was a pleasure to read. It didn’t race along but it didn’t need to. I enjoyed the way the truth is gradually revealed, and the underlying unease created by Gabrielle’s secret and Simon’s real intentions. Published by top class independent publisher, Louise Walters Books – here is a talented writer and her publisher to watch. This is my honest review in return for an advanced copy. Publishes on 7th March 2019 by Louise Walters Books.